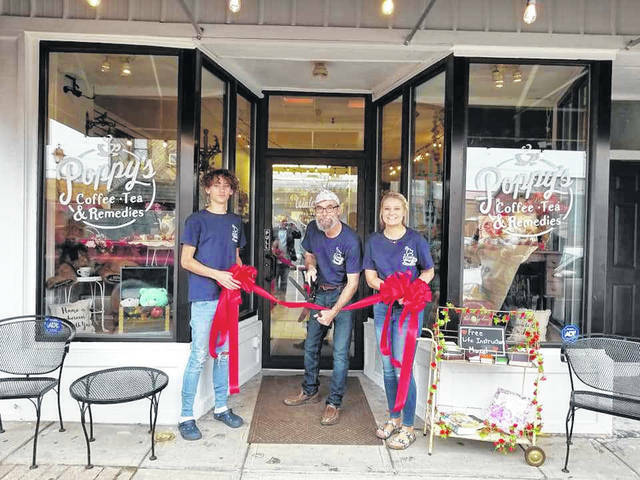 Poppy’s Coffee, Tea & Remedies at 46 Court Street in Gallipolis, officially opened for business on Jan. 2 with a ribbon cutting taking place on Jan. 19, which was also “Poppy’s” birthday. Owner Greg Hall, pictured at center along with grandchildren McKenzie and Blake Skidmore, said he wanted to celebrate the ribbon cutting on his birthday so he would never forget it. Poppy’s is described as a coffee shop complete with pastries, smoothie and juice bar and gift shop. Gallia Chamber of Commerce Board Members present for the ribbon cutting were Meagan Wood (Superior Marine Ways), Jenni Dovyak-Lewis (Area Agency on Aging, District 7), Amanda Ehman (Rio Grande Community College), Rick Jackson (The Wiseman Agency), Nick Dobbs (River Town Electric) and Chamber staff, Executive Director Elisha Orsbon, Associate Director Paige James. In addition, Poppy’s delivers pastries and drinks in the downtown area. Call 740-446-9050 for more information.